The Tigers have a big challenge on their plate tonight, facing a Ballard team that is one of the best in the state. They’ll be the underdog, but in this series the Tigers often are, and quite often as well this is the most exciting game all year. The Tigers defeated Ballard last year, so the Bruins will definitely be looking for some redemption. Tiger Baseball meets Ballard again for the second time this season. The Bruins and Tigers met back on April 14 at Mueller Field, where St. Xavier defeated Ballard 2-0. Both teams have been playing a lot better baseball since that game, so it should be an incredible matchup tonight for a chance to go to the 2015 Rawlings/KHSAA Baseball State Tournament in Lexington next week. Ballard last made it to the 7th Region Championship in 2009, while these Seniors were finishing up 6th Grade. The Bruins lost 1-0 to Trinity and hopefully they’ll take another loss from a Louisville Catholic high school again tonight. We’ve said it multiple times, but it’s worth repeating. The Tigers are seeking their 5th straight trip to the state tournament and a defense of their championship title. The target is beginning to grow on the defending champs’ backs, but they’re used to it and so is our whole school. It won’t matter that Tiger Baseball isn’t ranked No. 1 in the polls, they’re the most talked about team and everybody’s always talking about them. Let’s talk about a 5th straight state tournament appearance after tonight. After Saint Xavier Basketball scored a huge win over Eastern Tuesday night, the focus shifts to Friday night’s showdown against Ballard. There are many storylines to be discussed concerning the outcome of this game, and two of WSTX Sports’ best will break them down for you. First and foremost: Can the Tigers’ torrid shooting on Tuesday carry over to Friday night? Heichelbech: Everyone was hot the other night. No seriously, eve-ry-one. The Tigers hit six of their first seven threes, and it started with the man in the middle, C.J. Shanklin. At halftime, Shanklin was 3-4 from beyond the arc. He sparked an absolute torching performance from three-point land, as Ashanti Burgess and Lucas Miller cashed in on a combined seven more triples. To answer the question, I don’t think the Tigers will match their insane 67% from deep on Tuesday, but I do think they can heat up at any time. Once one guy gets in a rhythm, the whole squad seems to chime in and virtually anyone who checks in for the Tigers can knock down an open shot. Heck, sometimes I confuse Miller for a red-headed Jimmer Fredette. Hayslip: I agree; it’s almost impossible to sustain 67% shooting from deep, but Ballard cannot sleep on these guys. We’ve been waiting on this team to break out of its shooting slump for a while now, and Tuesday night might have been the first in a streak of impressive percentages. We all knew Burgess and Miller were elite marksmen coming into the season, and they are proving it now. What problems does Ballard present to St. X? Hayslip: Ballard is always a well-coached team that is usually far superior athletically than its opponent; tonight is no different. Last year, the Bruins attacked teams with ultra-electrifying tandem of point guard Quentin Snider and forward Kelan Martin, two guys that could score from anywhere on the floor and get a basket when they needed it most. Now, the Bruins are more perimeter-oriented, sporting two of the best guards in the state in Jalen Perry and Anthony Eaves, a transfer who played in North Carolina last season. These players are complimented by 6’7 senior center Corey Douglas, a great defender who isn’t nearly as polished on the offense as Martin was last year. Ballard will blitzkrieg you with barrages of three balls from Perry, Eaves, junior Brian Alvey and sophomore Jamil Wilson. I will put it this way: If Ballard hits its first couple of treys, it could get ugly. Quick. Heichelbech: Their shooting is out of this world for sure. But you can’t forget about the rebounding of the Douglas Brothers–Corey and Omardrick. They gobble up many of the three pointers that Ballard misses and provide valuable second-chance points. If you want to beat Ballard, you have to put a body (or two) on each of them when a shot goes up. Can St. X handle Ballard’s offensive explosiveness? Who will have a big game on offense for St. X? Heichelbech: There are plenty of candidates to chose from here. Burgess has been on a tear as of late, scoring 16 or more in the last 6 games. Shanklin showed us his ability to light it up on Tuesday when he went for 17 in only 23 minutes. This one’s tough, but I’m going to go with Miller. His versatility is so important to this team, and I love his range like I mentioned earlier. He can bang in the post or pull up from 20+ feet away. My prediction: 17 points, 4 assists for the Red Mamba. Hayslip: Watch out for the foul columns for both teams. On several occasions, Miller and Burgess have been plagued by foul trouble. The Douglas brothers on the other side must watch how they body up Tiger guards like Connor McKim and Will Olsen when they come barreling into the lane, because that is prime opportunity for St. X to pin some cheap fouls on the Bruins’ interior early in the game. Heichelbech: Keep an eye on the assist to turnover ratio for the entire team on Friday night. In the two games against Trinity, St. X registered a combined 13 assists (including 3 in the first meeting) and 32 turnovers. Moving without the basketball and sharing the rock is essential for good offensive flow. A mere three assists is extremely underwhelming and detrimental for the offense. If the Tigers want to take down a powerhouse like Ballard, they must clean up the unneeded mistakes. How can St. X win this Game? Heichelbech: Well Jacob, I think it’s pretty straight forward. The Tigers must limit Eaves and especially Perry. A victory is going to come with the Tigers valuing every possession, and looking for the open shots. I’m not going to say that they will have to shoot a certain percentage, because if they take care of the ball and have solid shot selection, the shots will fall. Also, it would help in a major way if the Tigers could win the battle of the boards. St. X is playing its best basketball at the right time. My prediction 74-71 Tigers. Hayslip: I’m going to be straightforward; I expect St. X to pull out a 71-68 squeaker. Whoever finishes with the least amount of turnovers will have a huge advantage, as you alluded to earlier. Coming off of a great performance against Eastern, this squad is on an emotional high. The team is hyped. The fans will be hyped. St. X will ride a wave of energy and passion to a huge win. With only two losses on the season, Ballard, is having a great season to date. The last time the Bruins traveled to The Wills Center, the student body for St. Xavier showed up in full force, filling the Rage Cage to the rafters and having a huge factor on the game play. Tiger Basketball is on a roll after defeating a very competitive Eastern team. That was a great win and momentum builder. Here’s something to note though: Ballard beat Eastern by 29. We beat Eastern by 21. Take that for what it’s worth. Who will prevail tonight? Can’t wait to see you at The Wills Center! Wear Black! The St. X soccer team advanced over Ballard High School on Tuesday night to keep themselves on track towards the state championship. In what was a scoreless game for 90 full minutes, The Tigers prevailed in penalty kicks to knock out the Bruins, who had defeated the Tigers 1-0 earlier in the regular season. Solid possessions were hard to come by for both teams in the match, and the scoreboard reflected this. St. X had dominated in recent games, but their scoring fire power was tamed by the Bruins defense. After full regulation time had passed and still no team had scored, the teams played two 5-minute halves of sudden death overtime. St. X finally started to attack hard on net in the second overtime period, but still could not convert. Overtime passed, and the game went in to penalty kicks. Both Ballard and the Tigers made their first three penalty kicks. On Ballard’s fourth attempt, Bruin striker Tucker Monheimer hit the ball high and far outside of the goal. Junior Colin Kremer followed the Bruin miss, nailing the ball “exactly where I always hit it in practice.” The game came down to Graham Reynold’s attempt. He struck the ball with poise and netted it past the keeper, immediately ending the game and giving St. X the victory. St. X plays Trinity in a grudge match on Thursday at Assumption Green in the next round of playoffs. Trinity, who defeated the Tigers in the regular season by a score of 2-0, is coming off of their first round of regional playoffs, where they defeated Central High School by enforcing the mercy rule, 10-0. In the earlier match between the Tigers and the Rocks, the difference in score came late in the game off of two quick goals from Trinity’s Greg Fischer. So far in the playoffs, St. X has defeated two teams that beat them previously in the regular season. St. X is currently rolling on a 7 game winning streak, and the Tigers don’t intend to have their streak stopped on Thursday. Wednesday evening, Saint Xavier Soccer faced the Ballard Bruins, a second opponent in two days. The Tigers fought hard but couldn’t pull out the win, as they once again lost 1-0 in another tight regular season game flush with intensity. After a tough loss against Male Tuesday night, St. X looked to build off of positive plays in the previous district matchup, but could not muster enough offense to win. Contrary to previous games, the Tigers came out playing sharp from the onset of the game. Accurate passes and a stout defensive effort early on contributed to several scoring oportunites. Early on in the match, Ballard forced an offensive fast break, but Senior George McCracken slid in to poke the ball out of play and smothered a big scoring chance for the Bruins. Moments later in the 17th minute, Clay Brown fired a shot from up above the goalie box. The shot was blocked, but the quality, early shot was an encouraging sign with the recent slow starts the team has had to endure. The offense got a shot of adrenaline with that sequence. The ball passed through Ballard’s defensive zone untouched multiple times in the first half. In the 22nd minute, senior midfielder and captain Andrew Schaefer found himself with the ball right in front of the Bruin goalkeeper. Schaefer had a hard time handling the ball, though, and his shot attempt came off weak. The Ballard goalie got a hand on the ball just in time, and the game remained scoreless. In the 38th minute, The Tigers had a communication breakdown defensively, and Ballard was able to capitalize, making the score 1-0 heading into half time. Just like the night before, the one mistake St. X made came back to haunt them. A second half team to this point in the season, St. X continued its strong play in the second frame against the Bruins. Neither side was able to grasp control of the second half, however. A sudden surge led by Schaefer in the 42nd minute gave the Tigers one of their best scoring opportunities of the night. He pushed the ball up field, drawing the attention of the defense, and then crossed the ball into the box to a wide open Trent Stigler. The junior midfielder struck the ball well with his head, but the ball was directed just wide of the goal. In the 45th minute, Senior Goalie Alex Popovich made one of the best string of plays of the night, as he fended away two consecutive point-blank shots on goal. Seconds later, Popovich charged out of the box to stop a Ballard fast break, keeping the score and the Tiger’s hopes intact. After Popovich’s clutch saves, the Tigers began to ramp up the tempo and move the ball with much more urgency. They made a flurry of trips to the Bruins box, but they were denied each time by senior Ballard goalie Zach Brooks. St. X was not able to create any more legitimate scoring chances in the final minutes of play. As the final whistle blew, St. X trailed 1-0, giving them their fourth consecutive loss. The Tigers were visibly disgusted after the loss; the post-game team huddle was laced with drooping heads and tears of frustration and disappointment. Saint Xavier Soccer is an elite program, both in the state of Kentucky and America. Four straight defeats is a lot to swallow for a group of players who are accustomed to playing state-championship level soccer all day, every day. Head Coach Andy Schulten made a statement to the team after the game. “After each loss, we need to get mad. After each win, we need to get better,” McCracken explained with an emphatic calmness. Currently, the Tigers have played four consecutive games without putting a ball in the net, and their scoring drought will hit 15 days before St. X will get a shot at snapping the streak. This coming weekend, the Tigers will make the long drive to Bowling Green to take on the Greenwood High School Gators with hopes of reclaiming the St. X pride and swagger that seems to be missing. Game time is scheduled for 1:45 PM. This wasn’t your ordinary game. The heat forced the contest between the Saint Xavier Tigers and Ballard Bruins to end after just a half, but it didn’t stop St. X from beginning the season on the right foot. With heat index readings of up to 106 at different points during the game, the 17-0 score in favor of the Tigers at halftime had to become the final score. Under rules, the maximum heat index that football can be played at is 100. KHSAA rules dictate that if a game is started and not finished, it can be considered an official game, as long no reschedule date is made. However, before the game ended, St. X certainly showed their promising potential. Each team ended its first possession with a punt. When St. X got the ball back for the second time, the offense made quick work of Ballard’s defense. After a couple of runs by senior tailback TaiJon Smith, senior Tiger quarterback Noah Houk found junior wide receiver Colin O’Daniel streaking down the right side of the field for a 42-yard gain all the way down to the Bruins’ 3-yard line. From there, Smith banged through the left side of the offensive line and found paydirt. The first quarter ended with St. X holding a 7-0 advantage. As the second quarter began, the heat really started to set in. Water breaks were frequent, and timeouts were much longer than usual. Early in the second period of play, St. X made another redzone trip after Houk found Ackerman in the middle of the field for a big gain. The Tigers couldn’t punch it into the endzone, but a Michael “Big Foot” Bennett field goal added three points to the St. X lead. Moments later, on the first play after the kickoff, Bruin quarterback Kenshawn Washington coughed up the ball in the backfield on a bad exchange with his running back. Butler recovered the fumble and almost broke loose, but he went down at the Bruins’ 14-yard line. Houk immediately went to the air and hooked up with senior wideout Jaylon Hibbs, who made a spectacular catch over the Ballard cornerback defending him for a 14-yard touchdown. Bennett’s extra point put the Tigers ahead 17-0. Ballard put together one more significant drive before halftime that crossed midfield but turned the ball over on downs after junior St. X safety Mike Ervin slapped away Washington’s pass intended for senior wide receiver Moe Masden, Jr.
Houk finished the shortened game 8 of 15 for 141 yards and the touchdown to Hibbs. He outgained the entire Ballard offense but was not completely satisfied with his performance. Ackerman led the Tigers in receiving with four catches and 63 yards, while Smith headed the rushing game with 10 carries for 36 yards and a score. St. X was without a significant piece on both sides of the ball, with junior halfback Chase Rowan still nursing a hamstring injury and senior linebacker Dylan McFarland airing on the side of caution and sitting with an aggravated bulging disc in his back. Although the circumstances weren’t ideal, Smith believed it was a positive team effort. St. X had 199 total yards to Ballards 89, although the Bruins did top the Tigers in possession time. The Tigers had nine first downs, while Ballard netted only 5. The Tigers will travel to Lexington next week to take on Bryan Station High School at Lexington Catholic High School. Kickoff is set for 6:15 p.m. at Lex Cath. As always, Go Tigers! We Are! Final Statistics from the August 23rd matchup between the St. Xavier Tiger Football team and the Ballard Bruins. Thanks to Jim Brinkman for providing today’s game stats! Today, the wait is over. Tiger Football returns to Br. Thomas More Stadium for a new season with high hopes. Projections have been released, preseason has concluded, the workouts have been finished, two-a-days completed, X’s put on… it’s now time for football! The Bruins of Ballard enter tonight’s game in a similar situation to the Tigers. Only eight total starters return for Ballard with one player already committed to play Division-I (Sean Hammonds – Ball State). The Bruins went 5-6 in 2013, but look to be improved on the offensive side of the ball after changing offenses to the Wing-T.
Tonight is Alunni Night at Br. Thomas More Stadium. The occasion will mark one of St. X’s key celebratory events for the school’s 150th anniversary. The first 500 alumni to register will receive free admission to the game and a free meal at the pre-game picnic. Tiger Football’s season opener against the Ballard Bruins has been postponed until tomorrow (Saturday, August 23) at 11:00 AM at Br. Thomas More Stadium. Tiger Nation was ready to see the season kick off, but Mother Nature had other plans. This is now two weekends in a row that the Tigers have had to reschedule for the following morning, so thank you to the Louisville Purge for preparing the team for this. We will see you bright and early at Tiger Tech as we try this one more time! Go Tigers! Saint Xavier High School last played a meaningful game on November 15th, 2013. They lost that game to Male High School, and it left a bad taste in the team’s mouth. It wasn’t how the Will Wolford era was supposed to begin. Tonight, Coach Wolford’s second season as head coach of the Tigers begins, and it should be an interesting start to what will surely be an exciting year. St. X begins the 2014-2015 season against Ballard High School in Brother Thomas More Stadium. Noah Houk emerging as the guy Tiger Football has needed. Standing at 6’4, 190 lbs., the senior signal-caller has the prototypical size to excel at the quarterback position. I asked him to rate his arm strength and accuracy on a scale of 1 to 10 compared to other high school QB’s. His answer: “Easy. 10 for both.” He’s confident in his abilities, and he certainly has the moxy needed to perform under pressure. It doesn’t hurt that his dad won was a state-champion QB himself as a Tiger. Will the esteemed Tiger Secondary come to play versus the Bruins’ high-powered air raid? In last season’s matchup, Ballard finished the game in the negative for total rushing yards. However, the game stayed close for a while because of the Bruins’ potent passing attack led by quarterback Rex Wallace and wide receivers Will Bush and Rollin Green. Those three are all gone now, but the passing game will still be a threat to the Tigers. Senior Bruin wide receiver Moe Masden is a stud; will Davey Sermersheim be able to lock him up? That will definitely be the matchup of the night; make sure you keep your eyes on those two, as they will be battling on the outside throughout the game. Inside linebacker Connor Barnes’ injury status. Barnes sustained deep bruises and a popped blood vessel to his left hand earlier in the week. He will still play, but his hand will be substantially taped and padded. He doesn’t think he will be bothered by it too much. “It’s one of those things that once the game gets going and the adrenaline starts pumping, I won’t even notice,” he explained. “The pain is something I can deal with after the game. I wouldn’t miss this game even if my hand was broken.” He sounds confident, but we will definitely be monitoring the anchor of the Tiger defense throughout the game. –1998, 14: The last time the Bruins were victorious over the Tigers was 16 years ago. St. X has won 14 consecutive games against Ballard. Will the streak continue? We will find out tonight. –5, 12: As we mentioned above, Sean Hammonds paced the Bruin defense with a dozen tackles for loss last season. He will be a handful for Tyler Haycraft, Nathan Scheler, and the rest of the Tiger O-line. If St. X allows him to make an impact on the game, Ballard could snap the aforementioned streak. –21, 2: St. X senior wideout Jaylon Hibbs caught two touchdown passes of 78 and 22 yards against Simon Kenton in an exhibition last week. If he makes a similar splash in this contest, we could see the Tigers run away with this one early. Tiger Basketball’s Lucas Miller starts off today’s tweets to the Tiger Football team wishing them good luck! We’ll keep posting your tweets all day long in preparation of tonight’s 2014 season opener against Ballard. Tweet @WSTXSports or use #BeatBallard! Gonna be a hot night to open the football season. Expect delays. Tomorrow Night is Alumni Night! Tomorrow night has been deemed Alumni Night by St. Xavier to help celebrate the school’s 150th Anniversary. Close to 500 alumni have registered to attend the game and receive their complimentary dinner and admission to the Tiger Football vs. Ballard game in a little over 24 hours. The evening will feature a picnic which begins at 6:00 PM on the soccer practice field near Gate 1. Kickoff is at 7:30 PM. A recognition ceremony for alumni will take place before the game. We look forward to seeing many Former Tigers in attendance tomorrow night. There is a special bond between St. Xavier graduates and their Alma Mater and tomorrow night will showcase that for all to see! Tomorrow night, the Tigers take the field for the first time under the lights in 2014! I don’t know about you, but I am super excited and can’t wait to bring you all the coverage your heart could desire over the next 48 hours. WSTX Sports wants to hear how excited you are for the Tigers’ home opener against the Ballard Bruins. Coach: Mike Jackson (seventh season, 41-31). Starters back: Offense 4, defense 4. Player to watch: Senior Sean Hammonds (6-3, 235) is a versatile athlete who will play tight end on offense and tackle, end and linebacker on defense. He led the Bruins with 12 tackles for loss last season and has committed to Ball State. “He’s big, but he’s very, very quick off the ball,” Jackson said. Other top players: WR/FS Moe Masden (Sr.), QB/LB Sam White (Sr.), FB/LB Jalil Brown (Sr.), RB/SS David Daniels (Jr.), OL/DL Jared Williams (Sr.), QB/DE Kenshawn Washington (Sr.), FB/LB Hayden Smith (Jr.), OL/DL William Mbumba (Jr.). Outlook: Jackson has scrapped the spread offense for the wing-T, hoping to take better advantage of his personnel. “We have to give our little guys up front a chance,” he said. “I think we’ll be able to block better with some deception and fakes and double-teams.” Washington, a transfer from Butler, is expected to start at quarterback. Jackson said Daniels is a “tough, hard-nosed” runner who also is the team’s best blocker in the backfield. Former Doss head coach LaKunta Farmer has joined the staff as defensive coordinator. Who do you think wins and why? Leave your prediction in the comment section below! The season is upon us and we could not be more stoked. A familiar foe will enter Br. Thomas More Stadium tomorrow and will pose a great test for the inexperienced Tigers. With only three of our starters returning to St. X to begin this season, not many players for this year’s team saw the Bruins in week one of 2013. 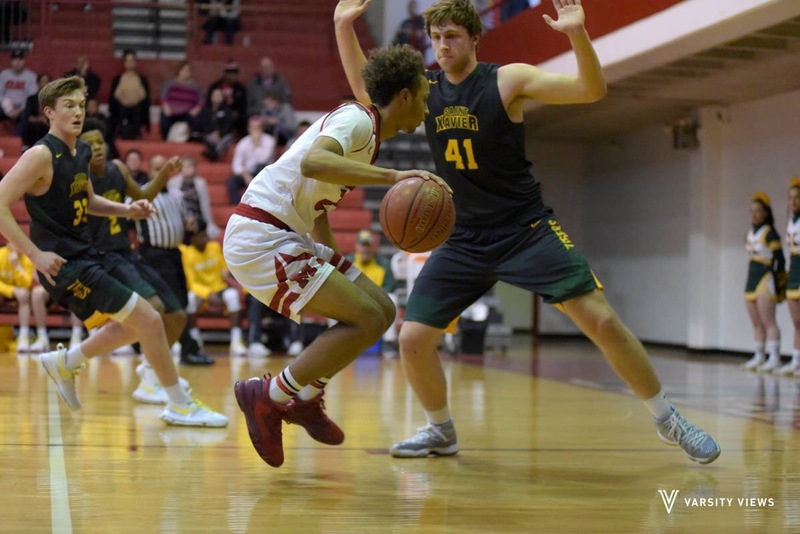 Ballard has done some reloading of its own and has totally changed their offense according to the Courier-Journal from the spread to the wing-T.
A lot of first game jitters will surely be in effect, so whichever team gets over those faster will win the game most likely. Ballard is known for their storied basketball tradition, but not so much on the gridiron. Nonetheless they pose a threat right out of the gates of the 2014 season, so everybody hold on tight because it could be a bumpy road to victory. 361 days ago, these two teams met at St. Xavier to ring in the 2013 season with the Tigers coming out on top 32-14. The score does not show how close the game was though. The score was 2-0 at halftime in favor of the Bruins if you can remember that far back… yes TWO points to zero. That lone score was by the way of a safety given up by St. X, but in the second half, the butterflies went away for the Tigers as they went on to outscore their opponents by 20 in the second half. Since this group of juniors were born, St. Xavier has not lost to Ballard in football. The two schools have played seven times and not once has the Bruins beaten the Tigers, even they came within one point in the regular season of 2010. Will Wolford (St. Xavier 1977-1981) – Lettered four years in both football and basketball, as well as three years in track. After high school, he accepted an athletic scholarship to Vanderbilt University where he graduated in 1987. A four-year starter for the Commodores, he was a unanimous First Team All-SEC pick after his senior season, and the first-round pick of the Buffalo Bills in the 1986 NFL draft. During his 13-year NFL career, Will played with the Buffalo Bills, Indianapolis Colts, and the Pittsburgh Steelers. He started in three Super Bowls and three Pro Bowls and was on the cover of Sports Illustrated in September of 1994. Devante Parker (Ballard 2006-2010) – Played for current Ballard Head Coach Mike Jackson during his playing days as a Bruin. He was one of the most electrifying players in the state and rated the 26th-best wide receiver by Scout.com, ranked the 77th-best wide receiver by Rivals.com and the fifth-best player in the Rivals.com Kentucky postseason top 10. He finished his career as one of the state’s all-time leading wide receivers, two-time All-State performer who caught 68 passes for 1,793 yards – 26.4 yards a catch – and 19 touchdowns as a senior. He was named first team All-State by the Courier-Journal. His high school football career was ended when he and the Bruins were knocked out of the 2010 playoffs by the St. Xavier Tigers. With the realignment of districts going into effect next season, we may not see the Bruins on our schedule for a couple of years and they are probably glad about that. There is always the possibility of seeing them in the 6A playoffs, but that is an unknown as of now as to how deep into the tournament it would be. Let’s look at this as maybe being the last time we see Ballard on the football field for a while and go out with a bang and a WIN.